Casey Bertke was one of three Lady Pirates to hit home runs in Cardington’s 14-3 win over East Knox Wednesday. She was joined by Baylee Adams, who blasted two, and Kierson George. Cardington got off to a slow start at home against East Knox Wednesday, but quickly heated up in dispatching the Bulldogs by a 14-3 count. Two of East Knox’s runs came in the top of the first inning, as Pirate starter Casey Bertke gave up four hits and a walk in that frame. However, over her next three innings of work, the Bulldogs could only muster one baserunner and were not able to threaten again until the game had essentially been decided. In the first game between the two teams, the Pirates won 17-3, which added to the coach’s worries of a letdown. However, some timely two-out hitting dispelled those fears quickly. After the Bulldogs recorded a pair of quick outs in the bottom of the first, Baylee Adams immediately put Cardington on the board with a solo home run. Chelsey Miller then smacked a double and was driven home by a double by Bertke that tied the score at two. The Pirates took the lead in the bottom of the second. Reanna Roth led off the inning with a single and stole second base. With two outs, the team got an RBI single from Kierson George. A single by Dana Bertke and a walk issued to Adams loaded the bases for Miller. While she was at the plate, a wild pitch scored George. Miller was then walked and Casey Bertke responded with a run-scoring single to give her team a 5-2 advantage. The team got another two-out run in the third inning when George drove in Ashlee Tharp with a double. Brininger noted that his team puts a lot of effort into situational hitting to make sure they’re confident in situations such as that. Leading 6-2 going into the bottom of the fourth, the Pirates put the game away with an eight-run inning highlighted by three two-run home runs. After East Knox got the first batter of the inning out, Cardington got a single from Miller, which was followed by a home run by Casey Bertke. Paige Clinger then reached on a single and a Roth double put runners on second and third. Tharp drove in one run with a single and Taiylor Hubley brought in another on a fielder’s choice grounder. George then blasted a home run to make it 12-2. A single by Dana Bertke was followed by Adams’ second blast of the game to account for Cardington’s final two runs. While East Knox tallied a run in the top of the fifth, they were unable to get the Pirate lead under 10, spelling the end of the contest. 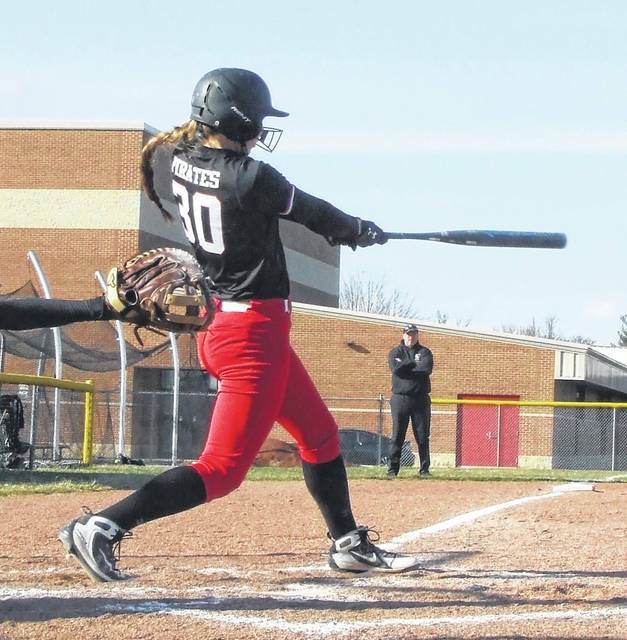 “We’ve had seven different girls hit home runs and we’re in game six — I would hate to face our line-up,” said Brininger, who added that his team is currently getting offensive contributions from everyone stepping up to the plate. The team finished with 17 hits against East Knox, with all nine starters claiming at least one. George and Casey Bertke had three each, while Dana Bertke, Adams, Miller and Roth all had two. Aside from the four home runs, Casey Bertke, George, Miller and Roth all added doubles. Bertke and Tharp combined to strike out four, walk one and give up seven hits.